For many years, the Southern African Institute of Welding (SAIW), has provided opportunities for young South African men and women to acquire the skills in the welding and related inspection industries that enable them to get solid, well-paid jobs. SAIW Executive Director Sean Blake says, “Over 75% of our graduates find meaningful employment and this, in today’s climate, is nothing short of miraculous,” he says. He adds that over and over, the SAIW sees how its training transforms people’s lives as they get jobs in a host of industries that use welding. These include the oil and gas, construction, aeronautical, automotive and shipping industries – in fact, almost any industry one can think of. Over the years the SAIW has created innovative cross-industry initiatives that have improved the standards in the South African welding industry. Since the introduction of its internationally recognised training programmes, it has also become the leading welder training organisation in Africa, with branches in Johannesburg, Durban, and Cape Town; uplifting thousands of individuals through welding. Take Houston Isaacs, for example, schooled in Saldanha Bay, Houston always dreamed of a job using his hands. 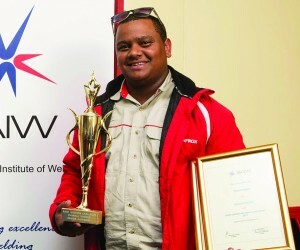 While employed as an operator at a well-known steel fabricator, his enthusiasm and dedication won him a bursary to train in welding at the West Coast TVET College. He completed his training in 2010, but jobs were scarce. That is, until he entered the SAIW Young Welder of the Year competition, in which he did brilliantly across all materials and welding techniques. A leading local gases and welding supplies company noticed his performance and immediately offered him employment. Since then, Houston’s life has changed. 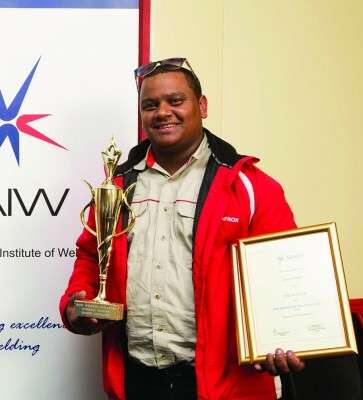 He says the future was uncertain until the SAIW put him on the welding map and that he will be forever grateful for the opportunity that the SAIW and gave him in life. And welding isn’t just for men either. Angel Mathebula’s SAIW Foundation bursary enabled her to compete and secure employment as an IIW International Welder. “We have many women on our courses and they often are the stars of the programmes. There is so much diversity in the welding and inspection world, there is room for anyone with the right credentials who is prepared to make the effort,” says Blake. The SAIW is an exciting place to learn welding and it is managed by the top professionals in the country. Its qualification and certification services are administered by SAIW Certification, an independent company that has been authorised by International Institute of Welding (IIW) as an Authorised Nominated Body for the IIW Education, Training, Qualification and Certification programmes. SAIW Certification also operates the SAQCC programmes for the certification of pressure equipment personnel as well as Non-Destructive Testing (NDT) personnel. The SAIW is holding an Open Day on the 11th January 2019 to show young career seekers what it can do for them. Don’t miss out on this opportunity, go to www.saiw.co.za and register. This could change your life.